"The story of how science works interwoven with the life of a brilliant scientist who not only created an entire new field of inquiry but just happened to live in the Animal House at Dartmouth. A marvelous, exciting adventure, elegantly written." -Daniel J. Levitin, author of This Is Your Brain on Music and The Organized Mind. Join us for an exploration into the intersection of Michael Gazzaniga's scientific achievements and his reflections on the challenges and thrills of working as a scientist. In the mid-twentieth century, Gazzaniga, "the father of cognitive neuroscience," was part of a team of pioneering neuroscientists who developed the now foundational split-brain brain theory: the notion that the right and left hemispheres of the brain can act independently from one another and have different strengths. Including a foreword by Steven Pinker, Tales from Both Sides of the Brain tells the impassioned story of Gazzaniga's life in science and his decades-long journey to understand how the separate spheres of our brains communicate and miscommunicate with their separate agendas. 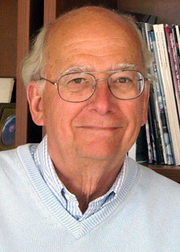 Gazzaniga is internationally recognized in the field of neuroscience and a pioneer in cognitive research. He is the director of the SAGE Center for the Study of the Mind at UC Santa Barbara and the author of many popular science books. He is a prominent adviser to various institutes involved in brain research, a fellow of the American Association for the Advancement of Science, and a past president of the American Psychological Society. He is featured regularly on public television and his research has been presented on NBC Nightly News and the Today show. Angie Coiro is an award-winning journalist and interviewer, host of the syndicated In Deep radio show. Her work has aired nationally on Mother Jones Radio on Air America, and on public radio. Bay Area audiences know her from Live From the Left Coast/The Angie Coiro Show; KCSM-TV’s “Spotlight!”; KQED's Friday Forum; KGO radio; and for many years of news and traffic reporting around the dial. Angie co-founded the Tech Connects interview series at The Tech Museum of San Jose, currently in its second year. In Tales from Both Sides of the Brain, Gazzaniga tells the story of his life in science and his decades-long journey to understand how the separate spheres of our brains communicate and miscommunicate with each other. Both humorous and moving, Tales from Both Sides of the Brain interweaves Gazzaniga's scientific achievements with his reflections on the challenges and excitement of working as a scientist. He paints a vivid portrait not only of his discovery of split-brain theory, but also of his many patients, friends, and family who have accompanied him on this wild ride of intellectual discovery. Those wishing to get books signed will be asked to purchase at least one copy of the author's most recent title from Vroman's. For each purchased copy of the newest title, customers may bring up to three copies from home to be signed. This policy applies to all Vroman's Bookstore events unless otherwise noted. Save your Vroman's receipt; it will be checked when you enter the signing line. Michael S. Gazzaniga , Human: The Science Behind What Makes Us Unique. Michael Gazzaniga is a Professor of Psychology and the Director for the SAGE Center for the Study of Mind at the University of California Santa Barbara. He oversees an extensive and broad research program investigating how the brain enables the mind. Over the course of several decades, a major focus of his research has been an extensive study of patients that have undergone split-brain surgery that have revealed lateralization of functions across the cerebral hemispheres. In addition to his position in Santa Barbara, Professor Gazzaniga is also the Director of the Summer Institute in Cognitive Neuroscience, and President of the Cognitive Neuroscience Institute. Michael S. Gazzaniga is currently considered a "single author." If one or more works are by a distinct, homonymous authors, go ahead and split the author. Michael S. Gazzaniga is composed of 11 names. You can examine and separate out names.